“How many heresies will you rehearse today before we get our way?” retorts Stephen curtly, stamping his foot and pretending to put an end to the discussion. The increasingly uneasy members of the curia blink and glance worriedly at one another in answer to the mad pope’s strangely compelling arguments — and the veiled threat to all to which they allude. Only the brave protester dares, once again, to respond. The cadaver of Formosus, nearly ten months in the tomb, now un-shrouded and carefully re-vested in its former papal attire, is brought before the tribunal and propped up, ironically, in a richly decorated papal chair. Despite the January cold of the old stone palace — heir both to the grandeur of antiquity as well as the power-madness of Rome’s many emperors — the effect of the richly clad, yet rotting, pungent, and maggot-infested corpse is evident upon the horrified faces of the curia, except for the glowing countenance of Pope Stephen. Acting as both judge and prosecuting attorney, Stephen remains as if in an ecstasy of triumphant hatred at the re-vision of his former enemy. “My lords,” stutters the corpse through its unfortunately chosen and visibly uncomfortable spokesman (a canon lawyer who also prefers to remain nameless), “ecclesiastical law — the legal procedure of our Holy Mother Church — can no longer hide itself amidst the ruins of an outmoded equation of justice with vicious (and in this case also impotent) revenge. ‘An eye for an eye’ is not the Christian, but rather the Hebrew way — the way of the pagan furies. Christ brought us a new covenant, a new commandment, the imperative to forgive our trespassers — particularly if they are deceased. “Sustained,” answers Stephen, confirming the validity of his own objection. “More lies from the German-loving, Holy Roman pawn of Arnulf of Carinthia! Why did you turn your two-faced back on our Carolingian masters, you braying pillock, in favor of the northern, long-bearded barbarians, eh? Why did you leave the Duchess Agilitrude and the House of Spoleto in the lurch by siding with the Germans against us? Foreign interests, I tell you! First claiming Bulgaria and then pimping the Holy See to the land of the lummoxy Teutons! You betrayed not only God through your false promises and transmigration of bishoprics, but your own land to these foreign interests! Here, breaking off, Stephen buries his throbbing head in Agilitrude’s gowns, moaning and weeping and muttering further curses into her petticoats. The lady looks a bit uncomfortable — perhaps even somewhat condescending — but consoles the pontiff, her kinsman, by patting him gently on the side of the great miter that he wears upon his swollen head. Moved, contrite, but still rather frightened, the counsel for the defense continues more quietly: “What possible defense can any man, living or dead — particularly one in the grips of a position of political power — offer but necessity? The winds blow as they will and every man’s ideals are but scattered leaves against the realpolitik of getting things done, of protecting one’s constituents, one’s own interests — or the greater interests of one’s position — and merely getting on to tomorrow without incurring more disaster than God allows. The world functions through a cloud of whirling contradictions, is buffeted back and forth through impossibilities that throw strange bedfellows together at every turn. What I undertook I did always for the best results in that particular situation. In answer to these protestations the disconsolate Stephen begins uttering a string of curses too filthy to be transcribed into this document. 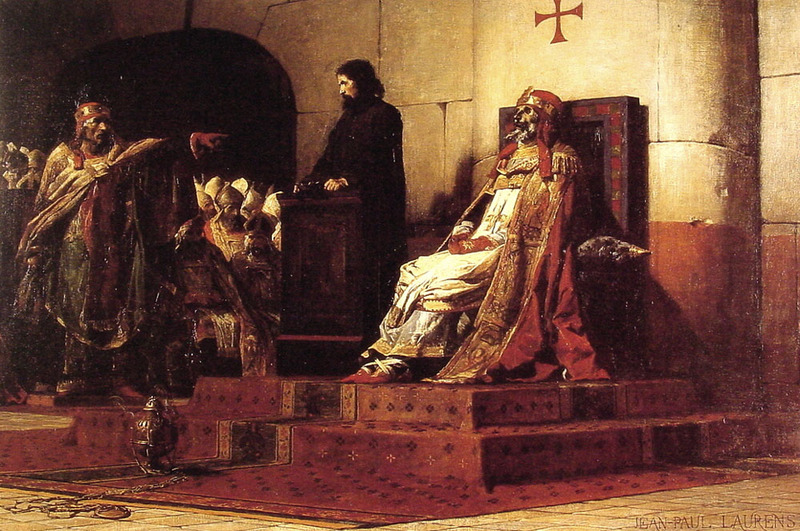 At last, finished with his tirade against the dead man — whose morality has nothing left to lose and therefore remains inviolable — Pope Stephen declares Formosus guilty of transmigrating sees against canon law, of acting as the bishop of Porto both after having sworn before a papal tribunal that he would never do so again and, because his excommunication was never withdrawn, whilst he was also a layman. Stephen orders Formosus’s corpse to be shorn of its papal vestments, all of the former pontiff’s acts and ordinations declared invalid (including Stephen’s own ascension to the bishopric of Anagni), for the three fingers of the cadaver’s right hand — which he used in his papal blessings — to be ripped from said hand, and, lastly, for the corpse to be cast into a common grave. All of these things come to pass. Days later, still unable to contain his near-demonic loathing for his predecessor, Pope Stephen has Formosus again disinterred and the cadaver thrown roughly into the Tiber. 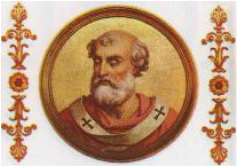 However, as history may have already told you, the body will be retrieved by renegade monks and, the following December, after Stephen has been imprisoned and strangled during a popular uprising, the succeeding pontiff, Theodore II, will overturn the verdict against Formosus and restore everything except for the cadaver’s three fingers and its dignity. I’ve asked around, but nobody seems to know what happened to the fingers. In saecula saeculorum, Year of our Lord 897. Signed, Ser Durante, papal scribe. Header art by T. Guzzio. Original photo by R. Miro. East Bay, California native Lee Foust relocated to San Francisco to study creative writing in the early ’80s; abandoning both, he traveled to Europe, a novel idea in his head, and fell in love with a fugitive Finn and the city of Rome. Later, he studied in Florence and NYC, obtained a Ph.D., wed a well-known rock critic, and co-edited Resister magazine. Still later, washing again upon Tuscan shores, Lee began teaching Literature and Creative Writing courses for a couple of US universities in Italy, re-married and fathered a child. Nowadays he rents in Florence with photographer Debra A. Zeller, writes a literary column for The Florence Newspaper, still teaches, and recites his own works, with and without banging a drum, to anyone who’ll listen. Foust’s fiction, poetry, and essays have appeared inAql, Dark Ages Clasp the Daisy Root, h2so4, the Village Voice, Semicerchio, Resister, WTF, and The Book of Broken Pages. He also wrote the “Crass” entry for the Spin Alternative Record Guide because no rock critic would touch it. In 2013 he published Sojourner, a collection of poetry and prose about the people and places Lee has encountered during his twenty-five years of travel. Learn more about Lee via his website, keep up with him through his blog, and follow him on Twitter and ﻿Facebook﻿. You can also hear Lee on Soundcloud.